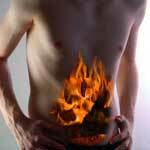 Causes of Acid Reflux - Top 5 Food Related and Top 5 Non Food Related! 1. Ain’t no thang but a chicken wing: Literally. Hot wings, and more globally, spicy foods, can bring on heartburn in an instant. Skip the atomic wings if you want to avoid an unpleasant evening. 2. Do you want fries with that? Nope. Apple slices please. Greasy foods can trigger acid reflux, and they are high on the list of acid reflux foods to avoid. Aside from the obvious health risks, greasy foods can send your stomach into turmoil. 3. But my OJ is healthy! Yes, citrus juices are good for you, providing vitamins and minerals, and….heartburn. You may notice acid reflux after downing a glass of fresh squeezed goodness or enjoying snappy orange wedges at a picnic but this tasty super fruit might be causing symptoms of acid reflux, or its ugly cousin, laryngopharyngeal reflux. 4. You didn’t need that coffee anyways: Caffeine can bring on acid reflux whether taken in your morning brew or in medications. Avoiding caffeine might help ward off a flare up of acid reflux. 5. Shimmy Shimmy Coco Pop: Or not: Of all of the foods that cause heartburn, the most unappealing one to give up might be chocolate. While giving into a craving once in a while might not spur your esophagus into turmoil, its best avoided for the most part. 6. Obesity: Obesity is one of the causes of acid reflux that when treated will also benefit overall health. Losing weight will not only make you feel better, it will also help to reduce occurrences of acid reflux. 7. Thanks Mom! : Typically a genetic gift, hiatal hernias frequently cause heartburn that requires treatment with over the counter or prescription medication. 8. You are wearing THAT? Tight fitting clothing around the stomach can bring on an attack after meals, so wear loose and comfortable clothing while eating. You can be in the fashion show after dinner. 9. Medication: Certain medications, including beta blockers and sedatives can be causes of acid reflux. You should NEVER stop taking medication because you think it is causing heartburn. But what you can do is speak to your doctor about your concerns. 10. Miami Vice: Smoking and drinking have been linked to heartburn, and quitting both will not only benefit your body in other ways, you may be rewarded with less discomfort after meals. There are many things that can cause acid reflux, but avoidance of triggers combined with proper medical care will help reduce the frequency of occurrences and the discomfort associated with your condition.